You know how this story starts. I had some turkey and a hankering for goat cheese, so I looked for an easy way to combine them. Hence, meatballs. 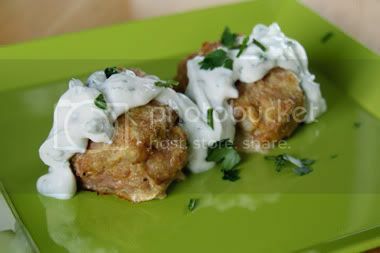 Turkey goat cheese meatballs. 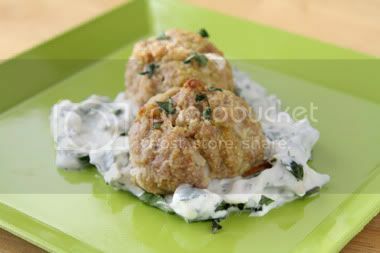 Balls of meat oozing goat cheese. It's like a mini version of food nirvana for me. Since I was only cooking for two, I used half a pound of ground turkey meat. And about two ounces of soft herbed chèvre. If I hadn't put it in the meat, I would've spread it all over crackers. This is an arguably healthier option. This is just about when I discovered lemon pepper, too. I've had it for a while, but have been hesitant to use it. This time I threw caution to the wind. Somehow the lemon pepper, turmeric, coriander, and paprika were perfect together. Quite deliciously perfect. I also made a very quick cilantro yogurt sauce for them (chop cilantro and add to Greek yogurt with ground ginger, ground coriander and garlic powder). It was a damn good combination overall. And disappeared far too quickly. Next time, I'll go for the full pound of meat. 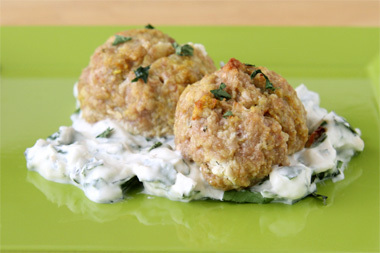 A simple baked meatball recipe, stuffed with creamy goat cheese goodness. 1. Preheat the oven to 400 degrees and line a baking sheet with aluminum foil. Lightly spray with cooking spray.2. Combine all the ingredients until well mixed. Make sure cheese is evenly spread throughout.3. Roll the mixture into golf ball-size balls. Space evenly on the baking sheet and bake for about 25 minutes until golden brown. Cheese might ooze out. Hi Misty. You can get about 8-9 golf ball size meatballs out of half a pound. If you use the whole pound, probably 16-18. Enjoy!